Reflex Handling and Storage has been offering materials handling, lifting and storage solutions for 33 years. Reflex Handling and Storage has offices in NSW and Victoria. Reflex Handling and Storage delivers anywhere in Australia, and has a growing export business. 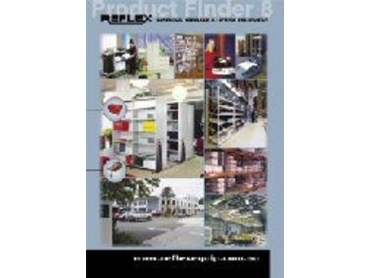 Reflex Handling and Storage has recently released the comprehensive Product Finder materials handling catalogue. This is the eight edition and is freely available upon request. Many products within the Product Finder are ideal to Reflex Handling and Storage. With its own dedicated manufacturing facility Reflex Handling and Storage offers a wide range of solutions. Product Finder is a large catalogue with a comprehensive range designed to reduce the risk of workplace injuries and increase productivity.